The final round of nine matches has concluded in Event 3, $3,000 Heads Up No Limit Hold’em/Pot Limit Omaha, at the World Series of Poker. 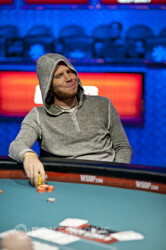 Leif Force has claimed his first WSOP bracelet and 207,708 reasons to party after defeating Jason Koon in a short heads up battle. Koon advanced over Obrestad, Naydenov advanced over David Benefield, Powell advanced over Merkow and Force bested Frankenberger to move on. The match of Powell vs. Merkow took almost all three hours allotted for each session. Powell defeated Merkow with only 15 minutes remaining in the hour so the start of the semifinal matches were pushed back an additional 15 minutes to allow for a break. Force never cashed in any of his rebuy lammers during his match against Powell and stayed in control of the match. After Powell cashed in his final lamer he opened to 40,000 and Force made it 120,000 to play. Powell called and the flop came and Force quickly put Powell all in. Powell folded and his last hand came ten minutes later when Force made a better two pair during the PLO round. 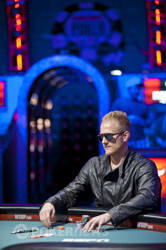 Koon took a six-to-four chip lead in a hand where he made top pair and Naydenov had middle pair. That loss forced Naydenov to cash in both his rebuy lammers. Koon then crippled Naydenov when he paired his ace and Naydenov had pocket sixes. Koon finished off the Naydenov after hitting a pair of nines on the river when Naydanov had only ace high. The championship match between Force and Koon lasted less than four full levels. Force took an early lead in the opening two levels and stretched his chip lead to 1.1 million to 300,000. At the start of the third level Koon cashed in his first rebuy lammer. 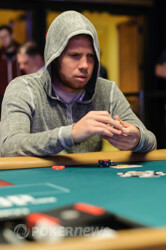 Koon evened things up when he got all in during the Hold’em round holding pocket jacks. Force called with but Koon flopped a set and rivered a full house. Force then got felted holding king high when Koon had a king high with a higher kicker. Force then used just one rebuy lammer to continue play. Just minutes later Force evened things up again when he rivered a flush during PLO. Then took a big lead when he made two pair and Koon missed every draw imaginable. The last hand happened with just a few minutes remaining in the fourth level. They saw a flop of , Force shoved and Koon called. Koon was ahead with two pair but the turn gave Force a flush draw. He prayed for a club and the dealer delivered with the . 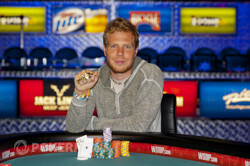 Force claimed his first WSOP bracelet and over $200,000. Leif Force captures the bracelet in event 3, defeating Jason Koon. It was painful, but at least it was quick for Jason Koon. The last hand came about when the two players saw a flop. Force tried to force Koon off his hand but he called all-in. Force: for a pair of eights. Force needed running cards to win and when the turn came he commented, "Wow, that was a good card for me!" He clenched his hands together, almost looking like he was praying as the river was revealed as to make his flush! It gave him all the chips and the coveted WSOP bracelet. Congratulation to Jason Koon on getting oh so close to his first bracelet. He'll be back, that's for sure. Leif Force enjoying the spotlight. Jason Koon opened for 85,000 on the button and Leif Force raised to 260,000 and Koon called. The flop came , Force moved all in and Koon called. The board finished and Force's two pair took the pot. The very next hand Koon shoved and Force called. Koon flopped a straight but Force caught runner-runner diamonds to catch a flush. Koon was felted and used his last rebuy lammer. The players are back to about even stacks again after Leif Force made a flush to double-up. A raising war took place and resulted in all the chips going in pre flop. The board ran making Leif his flush on the river. If you spent anytime at a Final Table last year when the Brits were out in force on the rail then you know how loud they can be. They are just getting warmed up singing "Give Us A Wave" and "Take Your Shoes Off." The clanging of bottles fill the dead air when they're not singing. The game has switched back to Pot Limit Omaha. Leif Force is down to one bullet. Jason Koon opened the button with enough to put Leif Force all in. Force called and the hands were tabled. The board ran and Force was felted. He opted use one his rebuy lammers and still has one behind. Both players have cashed one lammer in at this point. Leif Force shares a moment with his girlfriend, Andrea Sloan, after winning the bracelet in event 3.